A great power from above is ready to descend upon us. This power is the power of God that is ready to transform our lives and the lives of others. Like a hidden treasure, the power of God is an offering that most of us ignore. It is because of our limited knowledge of God that we may spend our lives in misery, we may lack things, we may want to see people being healed but it never happens, we may need our own healing but we dont seem to get any answers. In order to have that divine power acting on our behalf, we need to activate it otherwise it will be wasted. We are pure spirits hidden by our intellects; we are immortal children of God hidden in our human nature. We are very powerful beings, whose power is annihilated by our lack of faith. The power of God that He gives is not restricted to any human being. It does not depend on our age or education. God gives this power to everyone, conditions applied of course. God has revealed His Word to us in the person of Our Lord Jesus Christ. Jesus has given us all this knowledge of God His Father so that through our faith in Him we can become Gods children. As Gods children, the treasures of Heaven are open to us even while we are here on earth; they are like a reward to those who are willing to follow Jesus. Matthew 19:29 And everyone who has left houses or brothers or sisters or father or mother or children or fields, for my name's sake, will receive a hundredfold, and will inherit eternal life. As we become disciples of Jesus, we receive His instructions on how to do the Will of the Father and we are given the power to act as his instruments. The writings we are about to read are a lived testimony attesting to the power of God, to the Holy spirit miracles being manifested through prayer. Miracles have proven the reality of the following lines, so for your sake, for the sake of others and for the Glory of God, please open your heart and share the power from above. The knowledge of this book is really a treasure that has made spiritually rich all the saints, it is a beautiful guide that will inspire you to know, love and serve God as never before. The result will be the supernatural power of God being released in ways never imagined. Words simply dont describe the joy that is encountered living in communion with the Spirit of God. The gift is not like any earthly gift that perishes, the gift from above is God Himself. These inspirations were given to Joseph of Jesus and Mary, who also has received Messages from Jesus, Mary and God the Father. These writings are done for you, they are waiting for you to read them, rejoice and discover the powerful gift that you have as a child of God. The Holy Spirit miracles speak to our hearts through these writings. We experience great peace when we realize that He is the great power that sustains the universe, the power of God that is so close to us when we are close to him. These unique experiences with the power of the Holy Spirit will become a treasure for anyone desiring to grow in the faith and to learn how to pray for the Holy Spirit miracles. The teachings shared here will mold the soul of anyone with a humble attitude and a desire to have an intimate relationship with God, they are a true spiritual guide that can be imitated to call upon ourselves the power of the Holy Spirit. These writings about the power of the Holy Spirit are a beautiful gift to your spirituality, they will improve your religious motivation and your relationship with God. These words inspired by the Holy Spirit will touch your heart and soul, they will awaken your spirit to learn to live in God's Presence, to trust in His word and in the power of our faith. They will help you to discover the hidden spiritual meaning conveyed in the Holy Scriptures. 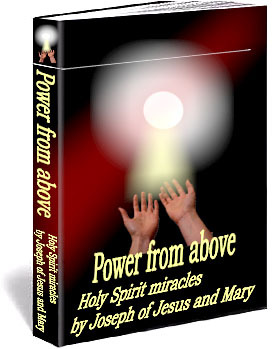 These writings and testimonies about the power of the Holy Spirit are excellent teachings for everyone who wants to grow spiritually, they were given to Joseph of Jesus and Mary, but the Lord wants you to read them because they are for you too.